Towing a car trailer can be daunting for a first timer, and even seasoned veterans may find themselves in a spot of bother every now and again. It may seem simple enough — throw on the car, strap it down, and away you go — but it’s not as easy as one might think. There is a science to loading a trailer properly, and the results of getting it wrong can be costly — not only to your pride and joy sitting up there on the trailer, but also for the trailer, the tow vehicle, its occupants (you), and any other road users. We were able to tag along as Greg Murphy’s show-quality Dodge Charger project got loaded onto a Futura Pro Low Loader trailer, to bring you a ‘how to’ guide for safely loading your precious cargo. As with all things, you need the correct gear for the job. Just because your mum’s Corolla has a tow bar does not mean it’s capable of towing another car. The bigger the tow unit, the more stable it will be on the road and the less susceptible it will be to having the trailer take control. All vehicles are rated for both a braked and unbraked towing capacity; this capacity is listed in the owner’s manual, and often on a sticker somewhere on the car. If your car is missing the manual, or you are looking for a new rig to buy, the Automobile Association has a comprehensive online list at aa.co.nz of ratings for most makes and models on New Zealand roads. Your insurance company will also follow these guidelines, so that is something to take into consideration. As the general rule of thumb, your fully laden trailer should, at maximum, be no more than three-quarters the weight of your tow vehicle. That should give you a good indication of the size the tow vehicle should be. That rating relates only to the vehicle itself and not to the aftermarket tow bar — confusing, we know, but the tow bar should have a rating label on the tongue. 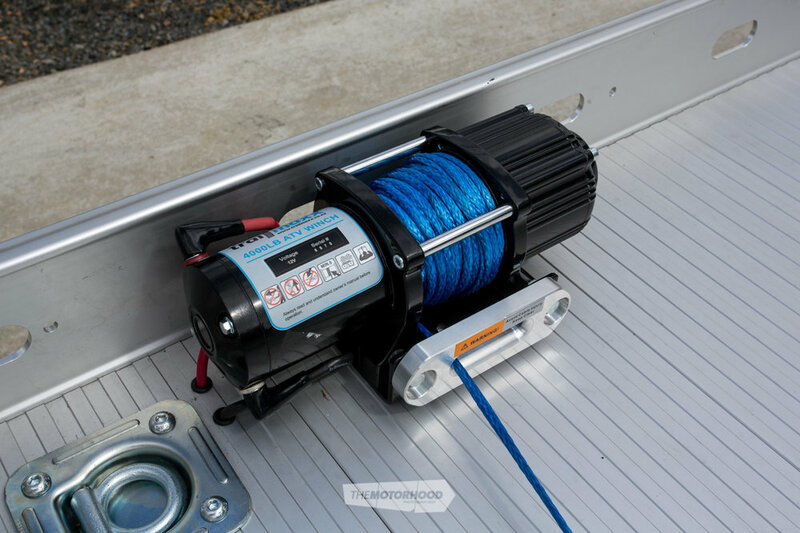 If you are towing with an automatic transmission, it would also pay to connect a trans cooler and look at upgrading to an appropriate race fluid, as this is designed to run cooler. Trans cooler kits can be picked up cheaply, and could be the difference between getting where you’re going and having your tow rig on a tow rig. When it comes to the trailer, there are a few guidelines to follow. A fully loaded trailer must weigh less than 3500kg to be classed as a light trailer. It must be no wider than 2.5 metres and no longer than 12.5 metres. If you’re looking at building or buying a trailer, the choice between single or tandem axle comes down to these factors: weight and preference. Single-axle trailers are much easier to tow — and manoeuvre by hand — and are generally much lighter. However, a tandem will take more weight and offers far greater security in the event of a tyre blowout. For the types of vehicles that most of the readers of this magazine would tow, it would be recommended to go for a tandem axle transporter. Futura Low Loader trailers — such as the one shown in this article — are made almost entirely of anodized aluminium, with the use of solid aircraft rivets instead of welds offering a lightweight trailer without sacrificing structural integrity. The Pro Low Loader’s 6x2-metre deck is designed specifically for larger-than-normal classic American vehicles, and is rated to carry a 2500kg gross vehicle mass (GVM). While convenience is not exactly a safety feature, it certainly plays a big part in ensuring that your stress levels stay down. The remotely operated lowering system and electric winch included on the Futura Low Loaders make it extremely easy to roll even the lowest of vehicles on — even if, like the Charger, they aren’t running yet. Modern technology in towing has also helped to make things much safer, with electric brake controllers coming as standard fitment on many of the later-model pickups. If your budget allows for it, we’d suggest opting for a trailer that comes with electric brakes — such as this example — or having electric brakes fitted. They are a joy to use in comparison with hydraulic brakes. Modern technology means there’s a cost-effective way to do this, with the aftermarket offering in-car brake controllers that plug into the cigarette lighter. The single most important aspect to towing a car safely is getting the car loaded onto the trailer correctly. As a good rule of thumb, you need 60 per cent of the weight forward of the trailer’s front axle. It’s not hard to achieve if you have a front-engined vehicle — simply load it on forwards; loading it on backwards will throw the balance way off. Both the trailer and the tow vehicle need to remain as parallel to the ground as possible. If you load too much weight on the rear of the trailer, the weight will be removed from the tow ball, lifting the rear of the vehicle, which often leads to the trailer swaying violently at speed, and can very easily result in a fatal accident. If you load too much weight on the front of the trailer, too much weight will be transferred onto the tow ball and tow vehicle. This can severely affect handling and braking by taking weight off the front wheels, and thus the contact patch with the road. This can also happen when there is a huge amount of weight in the rear of the tow vehicle — think toolboxes and excess fuel. Unless you have scales, you will have to rely on your judgement about the angle of both the trailer and the tow vehicle. At all times, you must have between 10 and 15 per cent of the weight of your loaded trailer on the tow ball. The ideal way to tie the vehicle to the trailer is either through the wheels or over the wheels, which are unsprung, allowing the vehicle’s suspension still to move. If you strop down using sprung components — such as the diff, subframes, or chassis rails — the strops will de-tension over any bump, allowing the car to move. While it should go without saying, please don’t ever put the strop over the vehicle’s bodywork. If the strop goes over the wheels, there is still a risk — however small — of a tyre going flat and the strop falling off. That is why having a strop on more than one wheel, and preferably all four, is advisable. 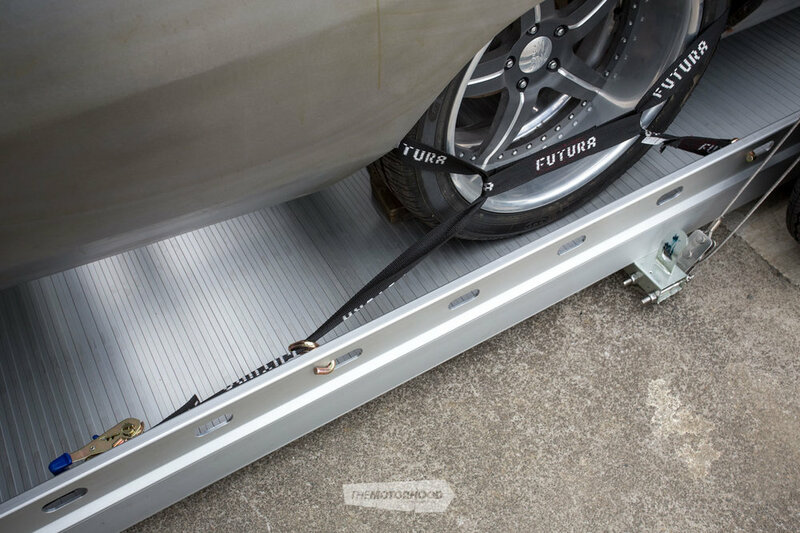 Futura offers an easier option for this than most, with multiple load-rated anchor points and special guide rails down the decks, meaning that, regardless of the size of the vehicle, you can tie the vehicle down simply and safely. This is aided by the optional strop kit, purpose made to fit wheel-and-tyre combos of just about any size. Unless you’re an octopus, these make life a breeze, eliminating the need to find and affix the ratchet end to a secure anchor point while keeping the strop taut and then ratchet-fastening the strop. When selecting the size and rating of the strops you use, it is imperative to consider the forces that will be applied to fastening devices. Say you have four strops — one on each corner — only two of those strops are ever going to be stopping the vehicle at one time; the other two will be de-tensioned. To calculate the load, you must multiply the car’s weight by 3.3 — for example, if it is 1000kg, that means 3300kg of force. Divide this by two — meaning 1650kg per strop. If you’re only using two strops, each of them will need to handle the 3300kg. So you’re fully loaded and you are heading down the highway only to find your trailer starting to sway. Whatever you do, don’t attempt to counter-steer or jam on the brakes. If you have an electric brake controller on the trailer, slowly apply the trailer brakes to bring the trailer back into line. Alternatively, change down gear and accelerate, as that should pull it back into line. Avoid counter-steering and heavy braking, as that will allow the trailer to continue pulling the car around and eventually you will spin or flip. Thanks to the team at Futura Trailers for allowing the use of one of their Pro Low Loader trailers for this article. To get more information, visit futuratrailers.com.